I love to see poetry in public places! With that idea in mind, I’ve created the first of what I hope will be at least several different haiku stenciled onto narrow slats of wood that I’ve decorated with beads or whatnot to balance them out and catch the eyes of passersby. Once I have a few of these mixed-media pieces, my plan is to hang them along the sidewalks of my town — but first I have to be able to part with them! LOL! spring evening . . .
some nodding no . . . 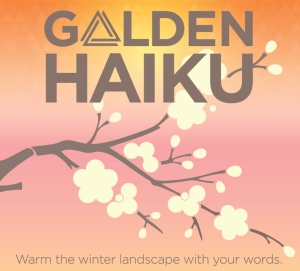 Published in Akitsu Quarterly: Spring 2016 (http://www.wildgraces.com/Akitsu-Quarterly.html), 3/2016. 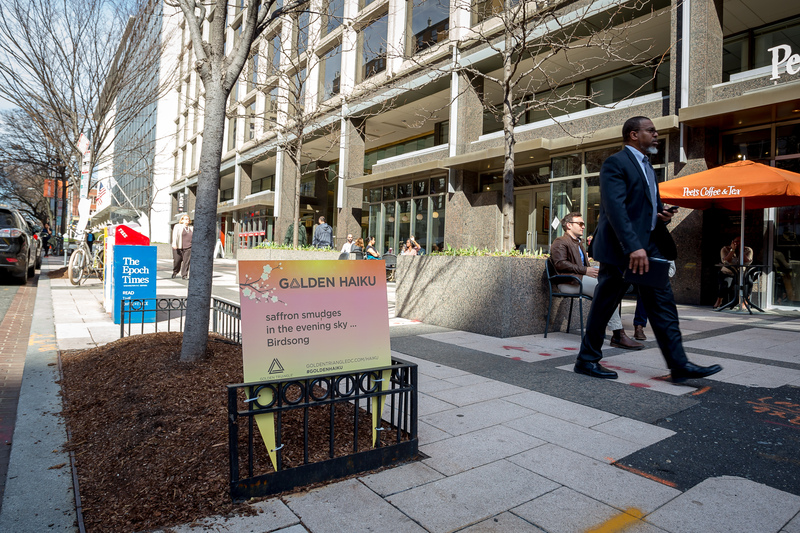 Spring is in the air, and haiku are everywhere in the Golden Triangle section of Washington, D.C.! 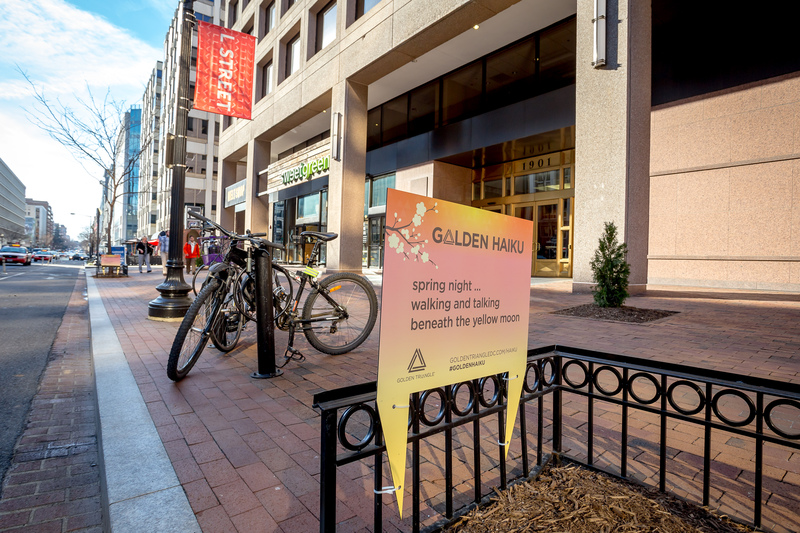 The Golden Triangle is “the 43 block neighborhood that stretches from the front yard of the White House to Dupont Circle,” says The Golden Triangle BID (http://goldentriangledc.com/about-us/), and to celebrate the season they sent out a call for haiku from near and far. 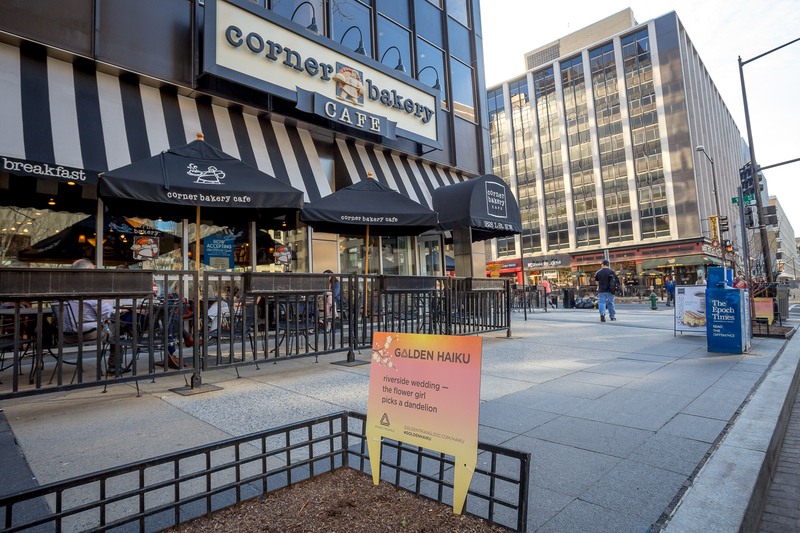 I love the concept of poetry in public places and am grateful as all get-out that a few of mine — printed on colorful signs and “planted” in roadside flower beds in downtown D.C. — will have a chance to brighten the day of passersby. spring night . . .